As you can imagine they did a fair bit of sightseeing including all the key sites in Edinburgh and Glasgow. 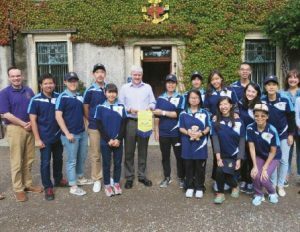 They enjoyed the Edinburgh Tattoo and particularly being welcomed in person by the Tattoo Producer – a good friend of the BB. However, for them the highlights of the tour were the visits to North Woodside Mission Hall where the BB started and paying tribute at Sir William Smith’s graveside. It was the first time I had heard “Will Your Anchor Hold” sung in Cantonese. International connections across the Brigade are a vital part of our work today and it would be good to encourage more exchanges like this. Most of the learning took place over a meal or a cup of coffee. Our visitors were interested to know why we had changed uniform, they also found it strange that our groups met mid-week and had a break in the summer. In the same way we were curious to know why they were still using our old badge system and that all their groups now only offer mixed gender work. I also discovered that boot polish in the UK is far superior to what they can purchase in Hong Kong! Yes there are differences but we are obviously still both part of the one BB movement. Over the last year or so the Brigade Executive has expended considerable time considering how we are organised and how best to provide support to local Companies. Some members feel the current system works well while others believe we should have a less centralised model. Coupled with this we now work with many different church denominations which can cause tensions too. Some of the discussions have been difficult and unfortunately some leaders have felt hurt and bewildered by all this. There are important governance issues to consider but I am often asked will this make a difference to how our Companies operate on a weekly basis? My experience of travelling around the UK and RoI is our Companies are all facing similar issues of sustainability and considering how best to share the Gospel in the modern age. It was all probably much easier for Sir William in 1883 when he didn’t have to worry about charity regulators and disclosure checks too! Paul famously used an analogy of different parts of the body to describe the early church. It seems to me that we too are an organisation of many parts, with varying approaches to the work that we do. However, we are all committed to seeking to present young people with the Gospel and to advancing Christ’s Kingdom. Please pray for the Brigade as we try to move forward.